Happy Monday!! It's that time of the year where I start to look for that something to treat myself to since Christmas and My Birthday are within 11 days apart, Every Year I decide to treat myself to one big boom present. From the picture Above that I've taken from Selfridges, You can see quite clearly that it's more or less an iconic bag, Black with Gold Hardware ( which is always a must with me, no silver) and it's a designer bag. For my 24th (which is on the 5th of January) as most of you know that have followed me all these years; I've wanted to treat myself to One Designer Product. That's my only little wish - One Designer Product. I was Lusting over the Louis Vuitton Damier Ebene Speedy 30 for over 5 years and the Price Point is more or less something i'd consider later (maybe for my big 25!) But Michael Kors's Designs are simple, elegant and eye to detail. 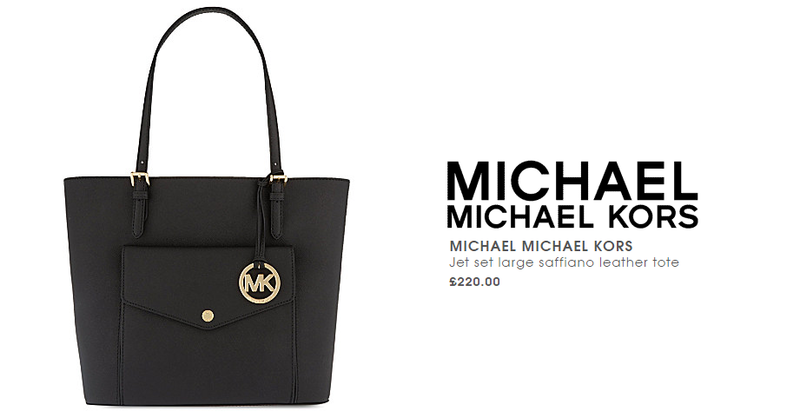 I headed over to Selfridges online and knew that out of all his bags, there will be one for me. The JET SET LARGE SAFFIANO LEATHER TOTE £220 in Black of course screamed my name. I dont own many Handbags to be honest, I am very picky and to be honest the last black handbag I Purchased was the Paul's Boutique Quilted Handbag from about 4-5 years ago and it's still in perfect condition. What's on your Birthday Wishlist?